Recently, I wrote about ecotourism and how it can help fund environmental efforts. Now I want to talk about wildlife conservation tourism – yet another exciting concept designed to support ecology and conservation as a whole. Wildlife tourism is one of the most popular methods now for funding environmental conservation while also instilling among tourists a sense of appreciation and curiosity for animals and their special habitats. Think about it this way: wouldn’t you be a little more sensitive to the needs of a manatee if you got to meet one up close and in person? Well, there are completely safe and legal ways to have a close encounter with a manatee – and many other types of endangered or threatened animals that are protected by federal laws. 3 Fun Wildlife Tours In The U.S.
Wildlife tourism is about much more than posing for a selfie with an exotic creature. It’s about getting in touch with a side of nature that many of us often forget about when we’re commuting to work, buying new furniture, tossing out tons of paper, and doing other things that can — in often little ways — actually harm the environment around us. Interested in supporting wildlife conservation here in the good ol’ U. S. of A.? Manatees, otherwise known as sea cows, are gentle giants that float along in the water eating a variety of submerged, floating, and shoreline vegetation. These endangered herbivores usually migrate into the Florida springs each winter to keep warm when chilly winter weather pours into the Sunshine State behind cold fronts. TIP: You have the best chance of seeing aggregations of manatees herding together near the shore from November through March. Because manatees are protected yet so many people want to get close to these unique animals, there are certain designated manatee snorkeling tourist locations throughout the Nature Coast of Florida in towns called Crystal River and Homosassa Springs — about 80 to 90 minutes north of Tampa, on the state’s west central coast. 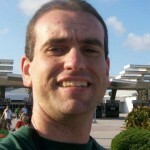 My fiancée and I took a manatee snorkeling tour near Homosassa Springs back in January 2013, during the peak of the winter season in Florida where we enjoyed an up-close-and-personal encounter with manatees. Manatee snorkeling tour companies work with the state to educate people about manatees and their sensitive environment, and through this form of wildlife tourism help support the cause of preserving manatees while giving people the once-in-a-lifetime opportunity to see these endearing creatures up close. Remember, it’s illegal to ride on, reach out to touch, feed, or give water to a manatee. 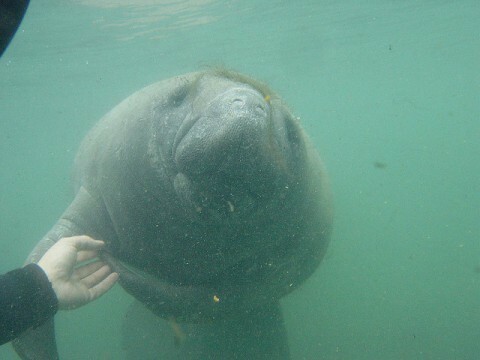 The best way to observe manatees is the “look, but don’t touch” approach. Speaking of large herbivores, elephants (which, by the way, are related to manatees) are another animal that intrigue nature lovers. At the Natural Bridge Zoo in Natural Bridge, Virginia (between Roanoke and Lexington, VA, on Interstate 81) you can hop on the back of an African elephant and take it for a ride! My fiancée and I are planning a trip to Virginia for later this year and we are looking into visiting the Natural Bridge Zoo because it’s one of the few such places in the country that offer elephant rides these days. And its mission is to preserve endangered and threatened animals without public funding. The zoo’s African elephant rides are a major draw. Every year, countless people line up to climb the 10 stairs that lead to a platform on which you can hop aboard the back of an elephant and take it for a ride. 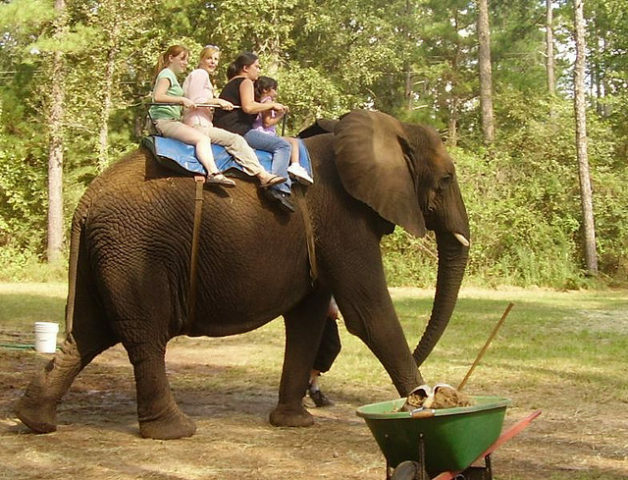 African elephant rides at Natural Bridge Zoo are held at various times, weather permitting. Sometimes elephant ride schedules are based on crowd turnout. Your best bet is to call ahead before planning a trip to get the latest information about the elephant ride schedule. Monterey Bay, California is famous in part for its resident population of Pacific harbor seals. 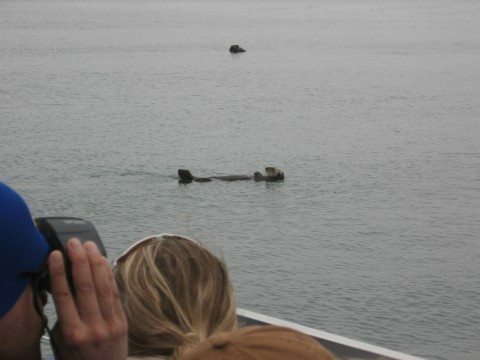 These harbor seals call the beaches of the Monterey Peninsula and the kelp beds just off the shoreline their home. 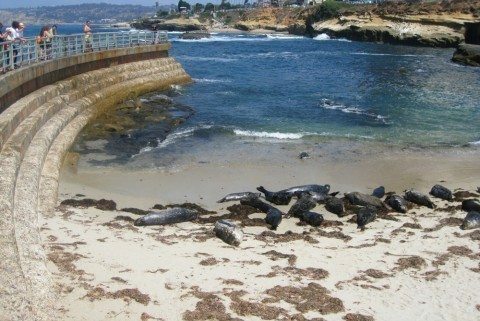 Between 250 and 500 harbor seals, along with their sea otter, sea lion, and elephant seal friends, can be seen along the shores of the Hopkins Marine Station preserve at Stanford University. The number of harbor seals depends on weather conditions and tidal cycles, but can be seen year round. In case you were wondering, it is illegal to take any of the seal pups or to in any way harass the seals. TIP: The #1 rule of wildlife conservation is probably best summed up this way: take only pictures, leave only footprints.